One in five children in the United States face hunger every day. In an effort to combat this problem, Grimaldi’s Pizzeria has joined the fight to raise awareness and end childhood hunger in America. 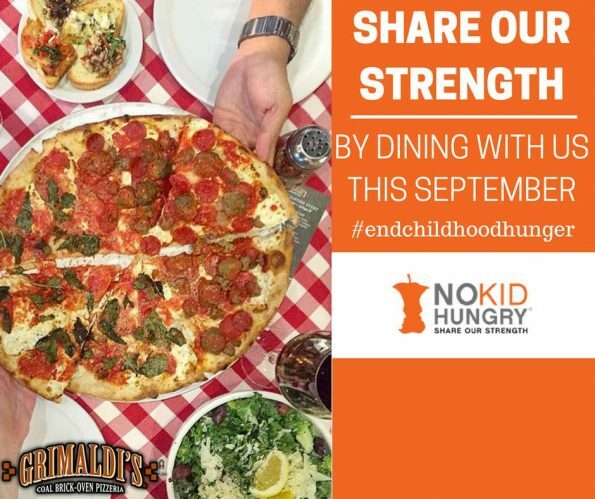 Throughout September, in honor of Hunger Awareness Month, guests who dine at any Arizona Grimaldi’s Pizzeria location can donate to No Kid Hungry, a charitable organization pushing to end childhood hunger in America by ensuring all children get the healthy food they need, every day. In return for their donation, guests will receive a bonus card matching their donation amount to use on their next visit. All of the proceeds raised will benefit No Kid Hungry. No child should have to worry about where their next meal is going to come from. The struggle of childhood hunger hits close to home, and knowing that Grimaldi’s can make a difference means a lot. Grimaldi’s loves being able to participate in No Kid Hungry year after year,” said Eric Greenwald, President of Grimaldi’s Pizzeria and Co-Chairman of the No Kid Hungry Board. Grimaldi’s Pizzeria is one of thousands of restaurants nationwide to support Share Our Strength’s No Kid Hungry ®. Many other restaurants, such as locally owned and operated Fired Pie, will also be participating in this campaign. In 2015, Grimaldi’s raised $300,000 for the cause. Since they have started participating in No Kid Hungry they have raised over $450,000. Funds are used to raise awareness about child hunger in the U.S., support nutrition programs like School Breakfast and Summer Meals, and educate kids and their families on how to cook healthy dishes with limited resources. In the world of pizza, Grimaldi’s is an institution that has garnered more awards than any other pizzeria in the country with more celebrity sightings than most 5-star restaurants. Using only the freshest ingredients, a “secret recipe” pizza sauce, handmade mozzarella cheese and dough, Grimaldi’s serves traditional pizza (as it began in Naples, Italy) in an upscale yet casual, family oriented pizzeria. The intense heat of the oven evenly bakes the pies to create Grimaldi’s famous crispy and smoky thin crust that Zagat has voted best pizza year after year. Grimaldi’s Pizzeria has eight locations in Arizona, including Gilbert, Flagstaff, Peoria, Tucson, three in the Scottsdale area, and one in Chandler.